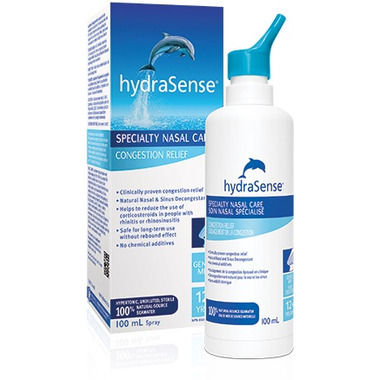 hydraSense Congestion Relief Specialty Nasal Care is a natural-source and clinically-proven decongestant spray that relieves nasal and sinus congestion caused by colds, allergies or sinusitis. Contains no chemical additives or preservatives. hydraSense Congestion Relief Specialty Nasal Care is safe for long-term use. Hypertonic, undiluted, sterile, 100% natural-source seawater, desalinated, equivalent to 22 g/L (2.2%) naturally-occurring mineral salts (including 1.8% NaCl) and a combination of other marine trace elements, without preservatives. Apply hydraSense Congestion Relief Specialty Nasal Care 1 to 2 sprays per nostril, 1-3 times daily followed by blowing of the nose for desired relief. Consult a health care practitioner for use beyond duration of 6 weeks. You may experience a temporary tingling sensation if mucus membranes are highly irritated. It causes no rebound effect. Do not use if nose or ears are completely plugged or in the event of ear infections. Consult a health care practitioner if symptoms persist or worsen. Do not share the device with anyone else. Do not swallow. If you experience any discomfort, discontinue using this product and consult a health care practitioner. Consult a health care practitioner if there is not improvement after you have tried to clear the nose; if the discharge is persistently thick and yellow or green; if you have other symptoms of illness such as fever or ear infection. Always read and follow the label.